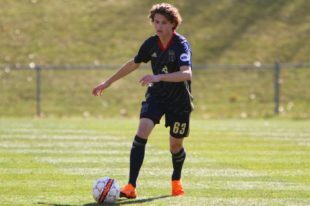 If you missed Philadelphia Union’s draw with Atlanta United this past weekend, you missed a homegrown teenager putting on a show. It wasn’t just that Brenden Aaronson had a solid debut and didn’t make mistakes. He was slinging through balls around like a European pro and was arguably the best player on the pitch. In Major League Soccer’s most hostile environment, against the reigning league champions, an 18-year-old very easily could have notched two assists and scored his team’s only goal. That’s not an accident or a coincidence. Earned it: As manager Jim Curtin said himself last week, Aaronson is “deserving.” If the Atlanta match is any indication of what he’s been doing in training so far this season, it’s no wonder he got the start. Forget about his story and forget about what he represents as a homegrown teenager — he flat-out earned the playing time with his skill alone. Just a number: Aaronson is not alone. Sporting Kansas City (Gianluca Busio) and LA Galaxy (Efrain Alavarez) have each already sent 16-year-olds onto the pitch this season — Busio even started a match. The reality is there are teenagers littered throughout MLS because it’s not just a retirement league anymore. Development is becoming more and more prominent and 16, 17, or 18 is simply not “too young” anymore. For the same reason Derrick Jones isn’t too young, Aaronson isn’t either. You’re either good enough, or you’re not. Midfield of need: In three matches this season, the Union midfield has left a lot to be desired. Record-breaking international signing Marco Fabian scored a penalty in his MLS debut against Toronto, but he also missed one and got sent off in the next match against Sporting. Haris Medunjanin has struggled from time to time in the holding role, and Warren Creavalle looked all kinds of out of sorts next to Alejandro Bedoya in Atlanta (he was subbed off at halftime). It remains to be seen if Aaronson can play anything but the No. 10, but if he’s one of the best four midfielders on the roster right now, shouldn’t he be seeing time? It sure looked like he was one of the best. Nothing to lose: Three games, one point. Things can of course change rapidly, but if the Union continue on this pace and don’t make a real run for the postseason. what will the argument be for not playing Aaronson? If they get into a rhythm with Fabian and start winning some matches, that’s one thing — you don’t want to force him into the lineup for the sake of it. But, hypothetically, if the Union have an underwhelming season, what better time to get Aaronson valuable experience and learn the ropes of the league? There is a lot of soccer to be played, but if the losing continues, the door should open. Long-term value: Speaking of teenagers excelling in MLS, Tyler Adams turned out to be majorly profitable for New York Red Bulls in a number of ways. He made 74 appearances, scored three goals, and was a fixture in the starting XI during a Supporter’s Shield run all before the age of 20, but that’s only half the story. He recently made his move to Europe and become worth millions of dollars. Putting aside that it was a Red Bull to Red Bull sale for a second, what if Aaronson becomes that type of talent? There is no way of knowing just how good he could be long term. He could either become an MLS star or move on to a big European club and make loads of cash for Philly. There’s only one way to find out. He’s not ready: This simply is not a viable argument after the Atlanta performance. You really can’t produce a more difficult scenario to come into on Sunday, and Aaronson absolutely thrived. If Curtin had any questions about his poise or readiness, they should have been put to bed as he was galloping toward the bench in celebration. He is ready and capable. He’s not good enough: If anyone wasn’t good enough in that match, it was guys that have been playing soccer since Aaronson was in diapers. Maybe the Union coaching staff have known he was good enough for a while and was just waiting for the right opportunity, but now the fans know just how good he is. Now opposing teams have a taste of what kind of ability he has. Aaronson is more than good enough and this argument will not hold up, either. Not a spot for him: This is just about the only point you could make about Aaronson’s playing time right now. The club brought in Fabian for two millions dollars as a designated player and an international figure — you have to play him. There is no arguing that, but it doesn’t mean Aaronson has to be benched. Can you play both of them by altering the setup a bit? Can he play in the central midfield? It might be a while before answers to these questions are clear, but in a lot of ways, benching Aaronson after that performance is not fair. With a number of players out on international break this weekend against Columbus and with the possibility of Fabian’s continued suspension, we very well could see Aaronson in action again. However, it will be much more about when everyone is available. When everyone on the roster is healthy and ready to go, will Aaronson be there? If he’s not, Curtin will have some very real and very fair questions to answer. He did more than you could have possibly asked for and made the absolute most of his opportunity — what will benching him say? It’s not about the Medford, New Jersey storyline or the optics of a successful youth academy. It’s about the Union winning MLS matches right now. If a teenager can help them do that, what others answers do you need? He’s not alone out there. It’s not an 18-year-old against the world. Soccer is the purest form of a team game and it certainly looks like Aaronson can be an influential part of the team. He did more in 74 minutes of action than a lot of midfielders have done in three matches. Brenden Aaronson is here, and he should be here to stay. I hope Jim Curtin has the courage and wherewithal to find a way to play Aaronson. It would be a shame to waste him. I’ve come to the conclusion that the Union can’t afford NOT to play Aaronson. The business model the team is pursuing depends on it. The only way to enhance the value of the team’s young players is to give them lots of meaningful minutes. With Aaronson, I don’t think anyone could question his readiness. Had the manager left Derrick in the line up after a quality start to his MLS firstteam career he might be worth a million or two… maybe more..
A ‘small market’ team with a ‘small market mentality’ has to use its asserts to its advantage to turn profits. We get to enjoy watching The Kids for a year or two – some stick around for a career, some phase out, hopefully many … ‘off to bigger and better,’ chasing World Class. Im as of yet completely unconvinced Union have this big a Vision until proven otherwise- I’m correct. Didn’t Anthony Fontana score a goal his first time out last season only to be relegated to a recurring role riding pine or playing for Bethlehem? Or is my memory incomplete? Your mind does not betray you. Plus Fontana isn’t really a 10 anyways. His best position is the 8, which Bedoya already has a lock on. So glad to see the seedlings germinating nicely, i also look for Anthony Fontana to make a contribution, trust management to aptly use them wisely and often. Its one of the reasons i continue as a season tix holder,,,,,, to see this occur. preferably an in-form Jones. Enough with Harris in this set-up. Either try him on the left or drop him, he can’t handle the defensive responsibility of the 6. Hopefully this happens sooner than later (obv not against Crew). Or what you have proposed, but with Monteiro at the 6 position. Nothing more knee jerk hyperbole than reviewing 74 minutes and projecting it as “here to stay”. I’ve been, unfortunately or not, a fan of this team. I have seen an easy dozen of wünderkinds here who have never panned out. Maybe this kid is legit, in fact he plays with a fearlessness that is refreshing. Let him make his mark w/o all this BS. Or rather PSPBS. Certainly a very fair point. There are a lot of minutes between his ATL performance and me lauding him to high heaven. Such is the reality of pro sport. The next big thing has always sold tickets and always will. Looking forward to tonight’s match. Gonna be an interesting XI considering all the absences.